A while ago a man called in to say my argument for the Assumption of Mary including references from the Old Testament was wrong. He prefaced his comment by saying that he knew the Old Testament well and it does not support what I had asserted. Well, if he DID know his Old Testament as well as he said, he would realize I was correct and he was very wrong. In the Old Testament, the kings of Judah following Solomon had queens but the queens were not their wives — but their mothers — with one exception of the queen being a grandmother. Solomon had 1,000 wives and concubines — but he only had one mother. Click here to read the section on The Great Lady or Queen Mother in Roland de Vaux’s book Ancient Israel: Its Life and Institution. The Queen Mothers of earthly kings of Judah were not always good examples or godly queens. Many of them were egregious sinners and would intercede for the people with improper requests to the king. But, this takes nothing away from the fact that the mother was the queen and intercessor. It only confirms that many of the Old Testament kings and queens were disobedient to God. But there is a perfect King and a perfect Queen — Jesus and his mother Mary. They follow the pattern of protocol and the royal institution. It is the royal protocol and the historical precedent and the office that is important in the analogy. Kings of Israel DO what Kings of Israel do and always have done. Jesus is THE king of Israel and would follow the protocol. Jesus is a king sitting on the throne of his fathers David and Solomon (Luke 1:30-33; Daniel 7:13-14; Rev 5:5; 19:16) and all the subsequent kings of Judah. Solomon was called the son of David because that’s what he was. But the phrase “Son of David” became a title of the Messiah. Jesus is referred to as THE Son of David (Matt 1:1; 21:9) and is therefore the ultimate and true king. The kings of Judah all had queens but the queens were not their wives — they were their mothers. This is the royal protocol of the Old Testament and the kings of Judah. It is ultimately fulfilled in Christianity and the Kingdom of God which, obviously, is based on the Old Testament model. Jesus is our king and obviously his mother is the queen. It is proper and justly so. 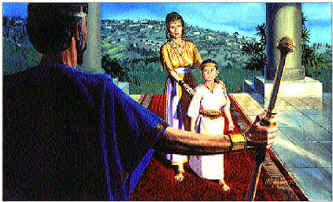 8) It is biblical, historical, and reasonable to expect the perfect Jewish king to follow the protocol of the kingdom and his fathers by assuming his mother to a throne at his right hand. 9) It is proper and biblical to consider Mary in a position of intercessor as the Queen of Heaven. 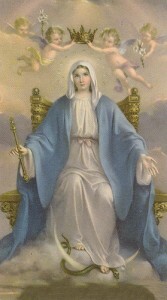 10) Mary is seen as the Queen of Heaven in Revelation 12:1. Is it impossible or unlikely that God would assume someone into heaven body and soul? All of us will be taken us some day (1 Cor 15:52). In the Bible there are at least two clear examples of humans taken up to heaven body and soul. Both Enoch (Gen 5:24; Heb 11:5) and Elijah (2 Kings 2:1-11) were taken up into heaven body and soul. Mary was not the first! There was already precedent set! Queenship of Mary is a Marian feast day in the liturgical calendar of the Roman Catholic Church,established by Pope Pius XII. On 11 October 1954, the Pontiff pronounced the new feast in his encyclical Ad caeli reginam. The feast was celebrated on May 31, the last day of the Marian month. In 1969, Pope Paul VI moved the feast day to August 22. One question was asked today about the Queen in Psalm 45. If the queen was the bride marrying the king, then how can we say the queen was always the mother and that it was a pattern by which we could see Jesus, like other Jewish kings, appointing his mother as his queen. I speculate a bit on the matter here. For a response to the argument that Jeremiah condemns those who worship the Queen of Heaven, click here. For more on Mary, get my documentary filmed on location. It is entitled Mary, Mother of God. You can learn more about it and order it here. 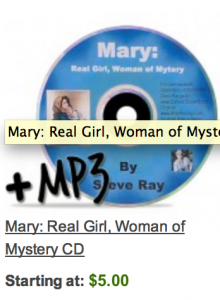 My talk Mary: Real Girl & Woman of Mystery here. The Psalm 45 question seems like another classic example where Catholics can say “both/and”. That is to say, Mary qualifies as Queen both as the mother of the King, and as His bride. After all, there was a time when she–as the first and only Christian–constituted the Church in her entirety. And as such, she was both mother and bride of Jesus the King. And not in some weird incestuous way of course. Just as we do not attribute anything homosexual to the fact that men are a part of the bride of Christ, neither is there anything unseemly in the fact that Mary, His mother, is also–as the perfect Christian example–His bride. I learned about you from a seminar I attended this weekend. A teacher from woodrose school mentioned your advocacy and I was really inspired and it made me proud to be a catholic. I am happy to know that there are people who defend the catholic faith. I want to be one of them. I have this friend, who is a protestant, who challenged my faith about the assumption of the Blessed Virgin Mary. He said that it is a void object of faith. He also said that it is groundless and that it has no reliable evidence. It’s just a pity that they are missing the beauty of our mother. I always enjoy listening to you on Morning Air 950 AM. As you may know, Eastern Orthodox Christians hold many of the same beliefs as Roman Catholics on the Virgin Mary, or as we call her, the Theotokos (Greek for “God Bearer”, the name the Church gave to her in 431-Ephesus). That is because we were one and the same Church until 1054 AD. One example of our agreement, based on the beliefs of the early Church, is that Orthodox Christians also agree in the ever-virginity of the Theotokos. As you rightly pointed out on this morning’s show with Sean, the early Church held this belief, and it is very well documented. Another belief by the early Church that is well documented is the Dormition of the Theotokos, which is what Orthodox Christians still believe. The Theotokos died a natural death – the Dormition – and then her body was assumed into heaven. That is the truth, and again, is well documented by the early Church. I would be happy to provide the names of homilies by 5th, 6th * 7th century bishops on this subject. I encourage you to learn about the early Church’s orthodox beliefs in the Dormition of the Theotokos. Excellent post and feedback. I’m not sure whether its been mentioned, but the Jewish model of the Geribah or Queen Mother was pretty much universal. I think I got that from Dr. Scott Hahn, including the fancy word which I’m surprised I could recall. Anyway, it makes sense because, if you remember, the Jews asked for a king like those of the nations surrounding them (1 Sam 8:5). So, it follows that they must have incorporated all the customs having to do with royalty and inheritance. Anyway, Our Virgin Mother fits all the requirements for Queen. 1st. A Queen is selected by the King. Our Lady is described as the Spouse of the Holy Spirit. 2nd. A Queen gives birth to a King. Our Lady is the Mother of Christ the King. 3rd. A Queen is married to a King. In a figure of the Church, Our Lady is the Bride of Christ. STEVE RAY HERE COMMENTING ON THE POST BY BLANCHE: WHY SAY THE WOMAN IS ISRAEL AND NOT MARY? DON’T YOU KNOW HOW JOHN WRITES ON MULTIPLE LEVELS? THE WOMAN IS BOTH MARY AND ISRAEL. SCRIPTURE HAS MULTIPLE LEVELS. THE OLD TESTAMENT BEGINS WITH A REAL MAN, A REAL WOMAN AND A REAL SNAKE. THE BIBLE ENDS WITH A REAL MAN A REAL WOMAN AND A REAL SNAKE. WE ALL AGREE THE MAN AND THE SNAKE ARE REAL SO WHY DO YOU DENY IN REVELATION THAT THE WOMAN IS REAL (AND NOT JUST FIGURATIVE)? (i) Who is that woman who carries a child in her hand? Many say that she is “Mary help of Christians with the baby Jesus”. Is this correct? (ii) Jesus God incarnate in-the-flesh also chose the 12 Apostles to preach the “Good News” to the uttermost parts of the earth. They laid down their lives for the purpose in fulfilling the “Great Commission”. Shouldn’t we also be exalting “equally” their exemplary deeds much how Mary obeyed the will of God? Does not the scripture say that God is not a “respecter” of persons (Acts 10:34)? In Revelation 12:1, John sees a vision of a woman “clothed with the sun, and the moon under her feet, and on her head a crown of twelve stars”. Note the similarity between this description and the description that Joseph gave of his father Jacob (Israel) and his mother and their children (Genesis 37:9-11). The twelve stars refer to the twelve tribes of Israel. So the woman in Revelation 12 is Israel and not Mary. The women associated with the Sun (Jacob) moon (Rachel) and twelve stars ( twelve tribes of Jacob) is Israel ( Gen 37:9-10). Israel is taken into wilderness for protection on eagles wings (Rev 12: 6,16, Hos 2:14-15, Deut 32:9-11). Israel is the women that brings forth Jesus Christ. Rev 12:5, Heb 2:16, Gal 3:16 , Rom 1:3). Mary is frequently depicted with Jesus in her arms. So, it could be Mary help of Christians or Mary mother of God or any number of other icons or works of art. Do you have a link? Yes. But that doesn’t mean that God doesn’t respect anyone. Nor that God doesn’t love some more than others. See Numbers 12, where God shows more love for Moses than anyone of his time. And see Job 42 where God shows more love for Job than his friends. In the same way, God the Son, loves His mother more than any other human being. Look again. There are not twelve stars on JOSEPH’s head. But 10. 2nd. It is not Israel that has the 12 stars on his head. 3rd. Israel is bowing to Joseph in that dream. So, the one that fits the description of Rev 12:1 best is Mary, the Mother of God the Second Person of the Holy Trinity, Jesus Christ. The New Covenant otherwise known as the covenant of consummation fulfilled all previous covenants, abolishing their temporal nature, and “completing the cycle of the covenantal revelation.” This covenant “was to be like all Old Testament covenants before it, in that it too would be centered” “not under the law but the under grace” of God (Rmn. 6:14) which was freely provided in the New covenant. This covenant was irrevocable being solely established by God’s promise of “I will” (Jer. 31:33-34). The New covenant was not unconditional, rather it required every individual to personally receive what God had offered. “Although Israel had failed in fulfilling its covenantal responsibilities, the Lord God of Israel would not fail in His purpose to establish a great people and a great nation to glorify his own name. The Lord’s intention to redeem a people to Himself from among the fallen of humanity would not be thwarted.” Every believer was therefore, allowed to take part in that covenant relationship with God, through Christ via the New Covenant. This covenant varied from its predecessors in that it did not require either circumcision of the flesh, or its laws written on stone. All of these temporal elements were fulfilled and abolished by Christ, leaving only an internal seal on the heart and spirit (Rmn. 2:24-29; Col. 2:11-12;2Cor 3;Heb 8-10). An “everlasting inheritance” (Abrahamic Covenant), an “everlasting priesthood” (Mosaic covenant), and an “everlasting throne and kingdom” (Davidic covenant) were all made only possible in and through Christ, the Redeemer. I grew up Catholic. Left Catholic. Now learning on my own. Not a Catholic at this time. Considering mother of the king as the queen was prevalent in a Hindu Royal family that ruled a part of the Indian state of Kerala. This royal family was one of the so called Princely States that accepted the authority of colonial Britten. The relinquished the power when India got independence in 1947. In this royal family, the king’s mother is considered as the queen. Additional information can be seen from the following web site. This royal family has the distinction of defeating the Dutch colonial forces. The commander of the Dutch forces, Eustachius De Lannoy, (a relative of subsequent American President Franklin D Roosevelt) surrenderd to the king. Due to this commander was responsible for the conversion of a local man whom Pope Benedict elevated to the list of the “venerated”.